Hello, We R friends! Tessa Buys here. I am the worst at remembering to buy wrap or bags for gifts. Thank goodness I have a crafty stash and fantastic tools like the Dial Trimmer to help me whip up last-minute gift packaging! For this “wild” little gift bag, I cut a panel of Amy Tangerine patterned paper and adhered it to the front of my bag. I added a tag, then set to work creating a super easy cluster of paper roses to embellish the bag. Using the Dial Trimmer and three different decorative blades, I cut a 1 inch wide x 12 inches long strip of Bazzill cardstock in yellow, pink and blue. To make the flowers, I first dampened the cardstock strips. I like to stand at the sink and wet my fingers, then run my fingers across the paper to avoid saturating it too much. Blot with a towel and then begin rolling, gently folding the decorative edge out to look like petals. Glue as you go (I used a hot glue gun) and secure the end of the strip with more glue. Repeat with the other two strips. When the flowers were completely dry, I glued them together and then added them to my bag with a couple of Amy Tangerine leaves (sticker and die-cut). In far less time than it would take to run to the store, I made unique gift packaging and had a little crafty fun, too. Thanks to the Dial Trimmer, pretty flower accents are easy and quick. What would you add these flowers to? Happy creating! Hello everyone! It’s Eva here showing you a coupon card made with the new Dial Trimmer and the Photo Sleeve Fuse Tool. The new Dial Trimmer has 6 different tools in one but one I love the most is the Perforate Tool, I used this feature to create a coupon card for a teen girl made with the Girl Squad collection by our friends from Pebbles Inc.
To decorate the front of my card I cut several 6 x 6 papers with the Wave Tool from my Dial Trimmer and glued them to the front of the card. Next I used my Sprinkle Punch and decorated the inside of the card with matching colors and a shaker pocket created with a plastic sleeve and a FUSEables card base. I marked my paper with 2.5 inch squares and typed my “coupons” with my Typecast Typewriter. Because the paper is going to be folded like an accordion, I typed front and back left a space in the middle. Using the Dial Trimmer with the Perforate Blade, create a perforated line every 2.5 inches. Embellish the blank squares with paper and fold like an accordion. To finish the front of the card use Stickers and Die Cuts from the same Girl Squad Collection. The coupons are glued inside the card and everything is held together with some twine. This was a Teen Girl card but you could modify this card for many occasions! The receiver just needs to slightly pull the paper and the coupon will tear off perfectly! Isn’t it cool! I love to receive (and give) interactive cards, they are so much fun! Did you already think of someone to give a coupon card to? Good morning, We R Memory Keeper’s friends, Laura here today. My kids just started back to school and I wanted to scrapbook a page to remember their first day and getting on the bus. I love the Oh Happy Life papers from Amy Tangerine and they worked perfect for this occasion. I started by using a background paper with different multi colored hearts on it. I found a fun paper that had patterned strips on it, one of which had a little some little buses on it. It was perfect for this layout. I used my Dial Trimmer to cut the paper into strips. I ended up using five strips from the same paper. 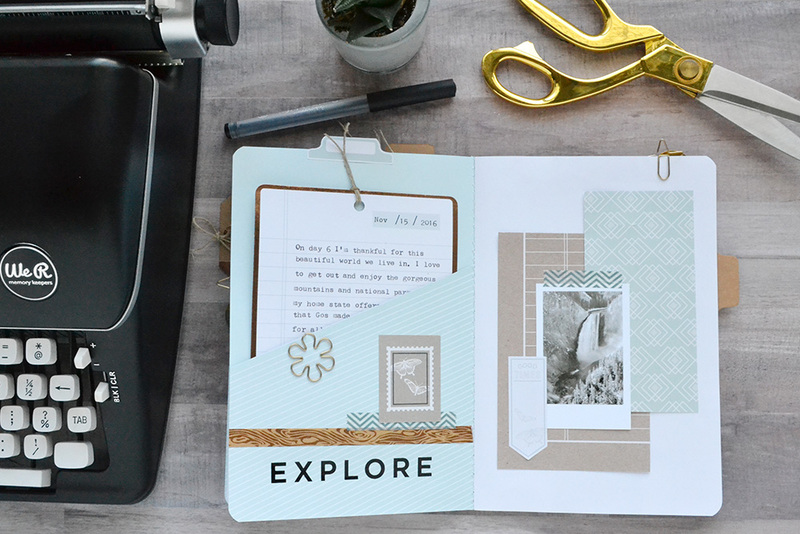 I wanted to create a scallop border on the top and bottom strips of the Oh Happy Life paper, rather than just having a plain flat border. Using the dial trimmer made creating a scalloped edge easy. Since the page was already so busy, I wanted solid color mats for all of my photos. To make the ones with the grade levels on them stand out, I used yellow cardstock and the Dial Trimmer to scallop all the edges. For the other smaller pictures I used white to mat each photo. Only one photo is in color to show their first day of school outfits. To finish off the page, I added gold sparkly Thickers to spell out Back to School 2017. I also added some beautiful layered paper stickers throughout the layout to add some dimension to the page. I love that I was able to trim all my pictures, strips of paper, and even scallop the edges of my paper with one tool. It made this layout come together really quickly. 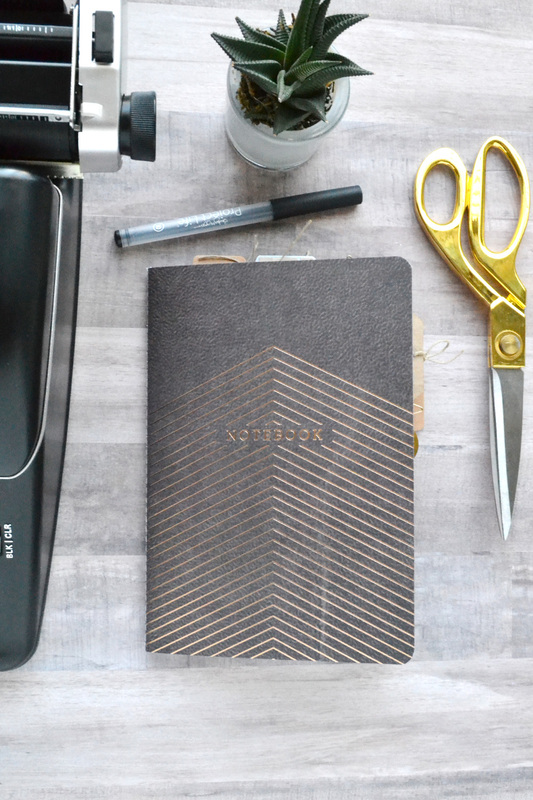 Hello, and welcome to Dial Trimmer Week here on the blog! 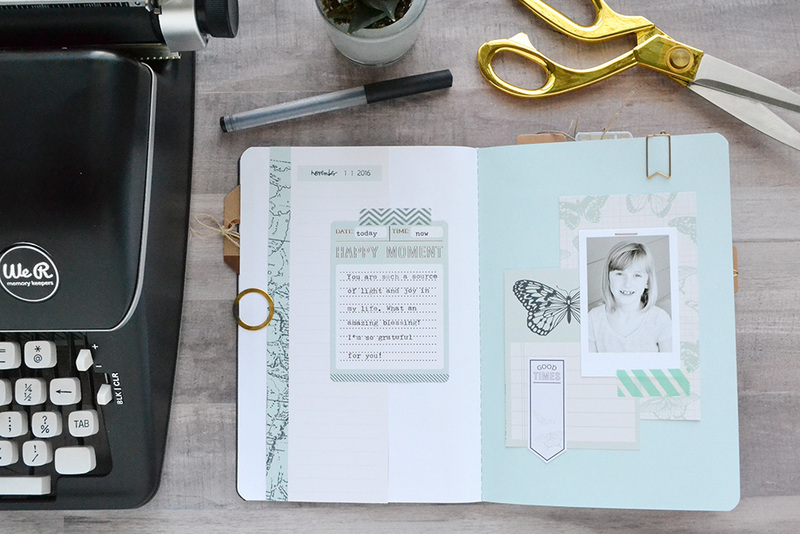 This week we’re sharing plenty of tips, inspiration, and project ideas featuring the new Dial Trimmer. With this must-have craft tool, simply turn the dial to select what type of blade you need for your project. It’s like six tools in one–choose from Cut, Score, Perforate, Wave, Scallop and Deckle designs. Plus, get accurate measurements and cuts with the handy 14 inch extension arm. 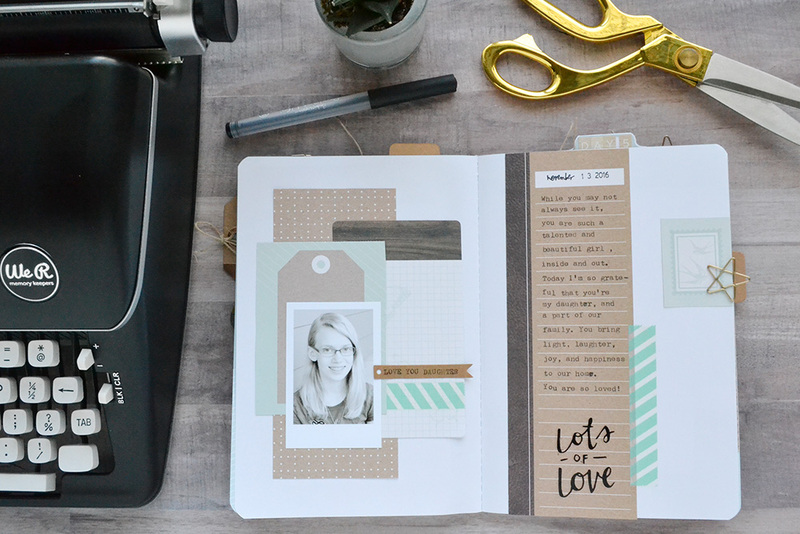 Here is a fabulous scrapbook page from our in house design team featuring this must-have tool. We just love the texture that the Dial Trimmer decorative blades add to this pretty beach themed layout! To celebrate Dial Trimmer Week, we’re hosting a giveaway on our Facebook page HERE. Click the link and then leave a comment ON OUR FACEBOOK PAGE to enter. Entries left here on the blog will not be considered for this giveaway. Have a great day, and be sure to stop by often this week for more Dial Trimmer projects. Hello, We R friends! Tessa Buys here. I love to Bible journal and wanted to find a way to include some of my favorite We R Memory Keeper tools. With a little experimentation I discovered how to add both a folded tab and stitching to my Bible pages. First, I searched for a verse that inspired some creativity and spiritual enlightenment, then pulled out some of my favorite Vicki Boutin paints and stamps. I scraped paint, stamped flowers, added a title and hand-copied a quote that related to the verse. Next, I created a folded tab for the edge of the page with the Tab Punch Board. I cut a piece of Bazzill cardstock to 2.5 inches by 5 inches, then folded it in half long-wise. I lined up my cardstock to the five inch mark with the folded edge at the top. I punched a small tab, then used the trimmer part of the board to cut off the excess cardstock. I then used the Stitch Happy machine to add a few lines of messy stitching to the side of the tab that would be on my journaled page. A more experienced sewer could probably sew this directly to a Bible page, but I found it easier to stitch on the tab and then adhere the tab to my page. If you do sew directly onto your Bible page, the folded tab will sandwich your delicate Bible page between the cardstock, keeping your Bible page from tearing. If you try my method, the other side of the folded tab makes for a nice clean look in case you want to journal on the back side of your page. I used the Typecast typewriter to type out the Bible reference onto a piece of washi tape, then adhered the washi tape label to my tab. I secured the tab to my Bible page with a tape runner. Making the tab was super quick, so I’m sure I’ll use that technique often. Adding texture with stitching was fun, and something I’ll definitely try again. If you journal in your Bible, I encourage you to try making your own tabs, and I’d love to see how you stitch on your pages! Happy and blessed creating! 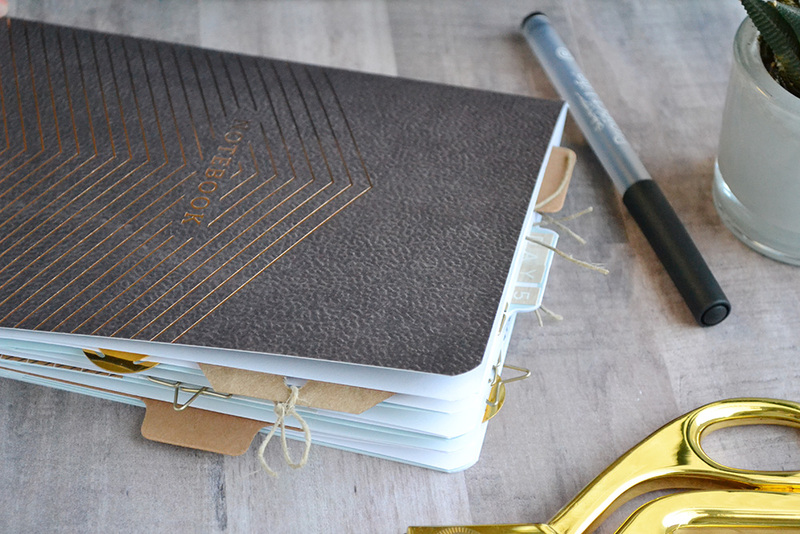 Pre-bound notebooks are a great way to journal thoughts, emotions, moments, and memories of all kinds. 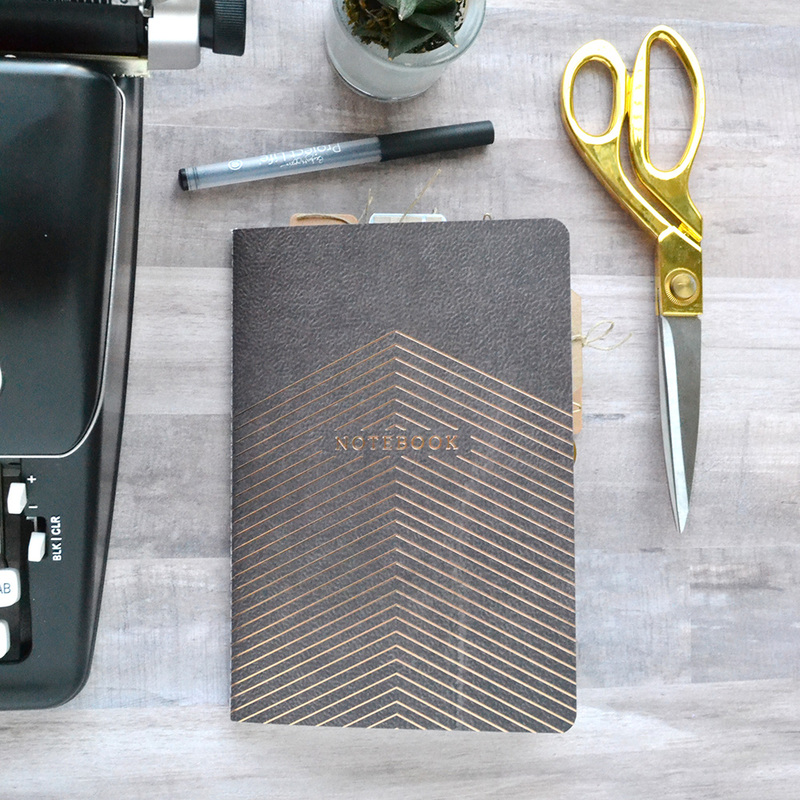 The Typecast Mint Paper Collection includes some bound notebooks with darling pockets and inserts, perfect for recording your life. 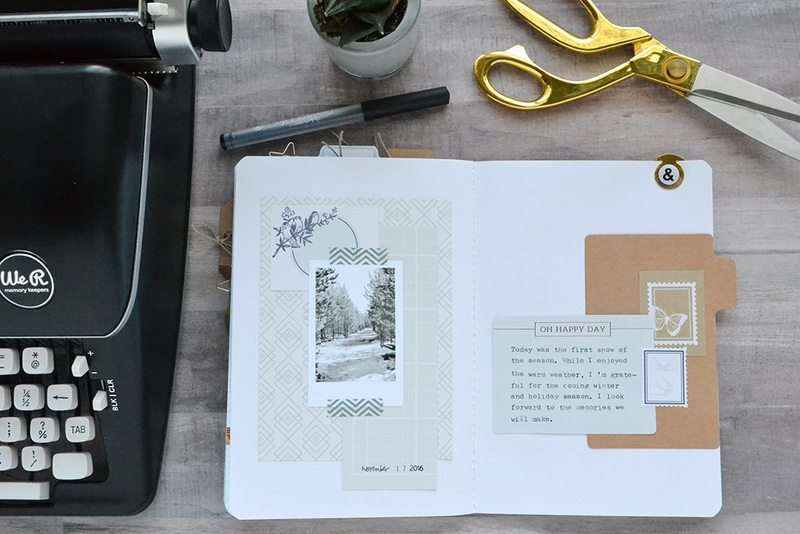 Last fall, designer Aly Dosdall shared a gratitude journal she made with the Typecast notebook, tags, mini cards, and paper pad, along with her Typecast Typewriter. Check out her post below! I love these Typecast Pocket Notebooks–they’re perfect for art journals, memory keeping, mini albums, and smash-style journals. Hello and welcome, Chantalle with you today! It has always been a dream of mine to explore North Queensland and these upcoming school holidays our family will be doing just that! 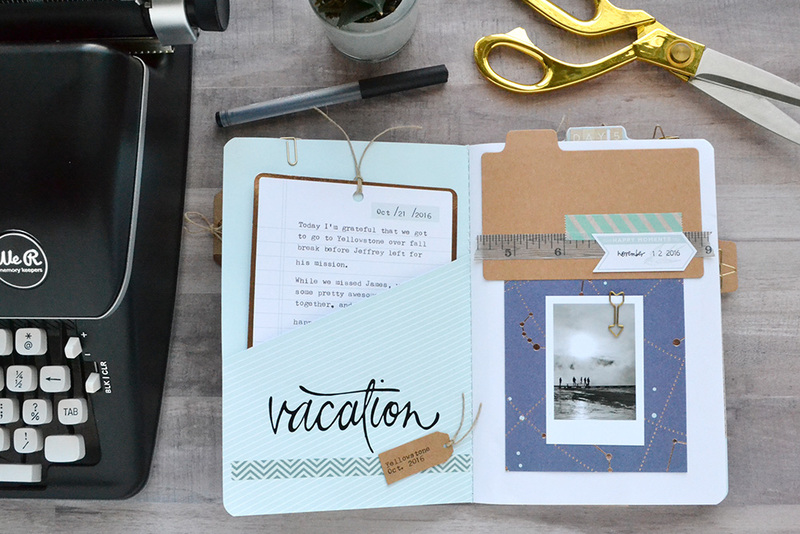 A tropical adventure is exactly what we need to chase the winter blues away and I have created a quick and easy traveller’s notebook to capture the memories we will be making along the way! I’ve kept the journal quite slim so I can pop it in my carry on luggage or have it in the rental car. It started life as an old book that I found at a thirft store. I carefully removed the covers, leaving a nod to the original cover art by leaving a border of the green leather and then recovered the sides facing out with some beautiful papers from a Jane Davenport 8.5 x 11” Paper Pad. I used my Crop a Dile Corner Chomper to round the edges of the paper so they matched the bookboard which was rounded already. The underside already had a pretty gold print, but it was fading, so I used a Dear Lizzy stencil and misted some coordinating shades of Color Shine over it and let it dry. On the front cover, I have used some stamping, rub-ons and stitching to add detail. The feather stitching was created by using an Amy Tangerine Stencil which I have had in my stash for a while. I love the sense of whimsy a feather brings! Before I started stitching, I had already laid down so stamping in the form of a large date and some pretty florals from Vicki Boutin’s Die and Stamp sets. These sets are so clever, combining coordinating metal dies so you can produce 3D effects for your projects! The book opens to reveal a vellum Typecast envelope which I have included and filled with some cute ephemera to be used as I journal. It can also be used to store bits and pieces I collect along the way. Within the book I have also included some page dividers. For reference, the book cover size is 206mm (h) x 117mm and the pages are 4.5 inches wide x 7 5/8 inches high. These dividers were created with my Tab Punch Board and have a ‘small’ size tab. I haven’t done too many dividers, but if I chose to add a few more in later, I could always punch the holes into the divider and then carefully snip the section between the bottom of the punched circle and the edge of the divider, and then pop the divider onto the binding comb. The back cover has been kept quite simple with just a bit of stamping. Here’s another look at the front with an elastic closure I made to size, using Jane Davenport’s Charm Set. It comes with three coloured elastics, which you can trim to size, then secure with fastners which come in the pack. I’ve also added a chipboard Thicker title and some of my fave Photolights Rub-Ons. I just love how easy these rub-ons are to apply! Thank you so much for stopping by the blog today! Happy travels! Hello We R Fans! Kimberly here today with a quote journal project. I don’t know about you, but I love quotes. I have a pin board dedicated to some of my favorites. Well, it was high time to take those words off the screen and turn them into a beautiful mini journal. My We R Memory Keepers Cinch and Typecast helped create a lovely quote journal that I will enjoy looking through when I need some inspiration and encouragement. The plan was to create a 6×6 journal. I started by punching Cinch Bookboard for the front and back covers. The Cinch easily punched through the thick board. The Cinch is also easy to use, as the punching information is printed directly on the machine. Making a 6 inch book? Pull pin 12. Incredibly simple! Each of the pages inside the book started as a watercolor paper base. On some of the pages, I wanted to experiment with different mediums, which is why I chose something other than card stock. So not only was this a journal for my favorite quotes, but a chance to play with papers, mediums, and colors that spoke to me. Now my pages were ready to be decorated, before assembling the journal with the Cinch wires. When you do assemble your book, be sure and place the pages on the ring first, topped with the front cover and then the back cover. Doing this allows the wire edge to be hidden inside the book. Once again, the instructions are on the machine for closing the wires. Using the Typecast was a fun way to write out my favorite quotes. For this quote, I typed a few of the words on Typecast Paper, knowing that I would use stickers to spell out words I wanted accented. I found that advancing the paper twice created a nice amount of space between these words. I cut these lines of words out with scissors. For some of my quotes, I typed them out in their entirety on Typecast Tags. It is easy to place any size paper in the Typecast, even up to 12×12” paper. For the base of this page, I applied Heidi Swapp gold screen print paint through a screen. The tags are from the Typecast Mint paper pad. The quote on this page was typed onto a tag. I layered it with stickers, other Typecast papers, and a large word sticker. 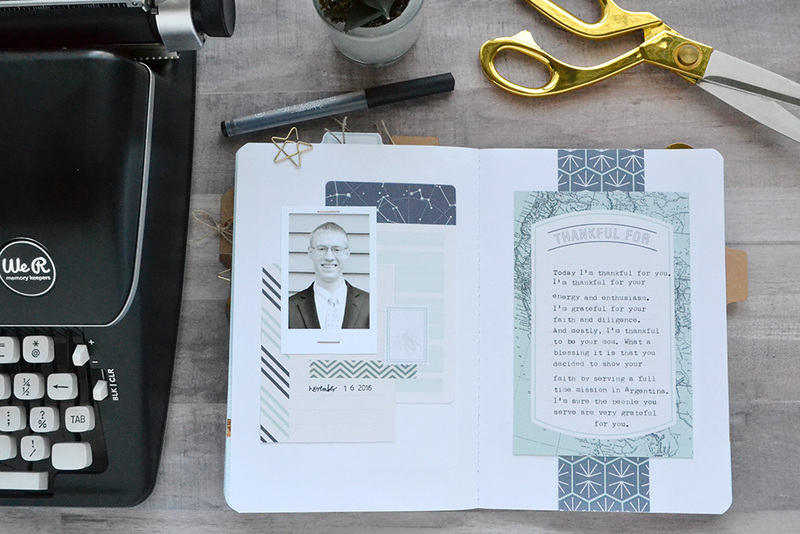 This page was layered with a piece of patterned paper from Jen Hadfield’s Heart of Home 6×6 paper pad. The gold printing fit into my color scheme perfectly. Once again, the quote was typed onto a Typecast paper pad tag. More patterned papers, die cut accents, and a quote typed onto a paper pad tag. I love how easily this album worked together with all the tags in the paper pad. So many typing options! My final page mixed typed words with letter and word stickers. This might be my favorite page! I have to keep this mix of wording in mind for layouts and even a card! What are your favorite quotes? How do you like to display them? 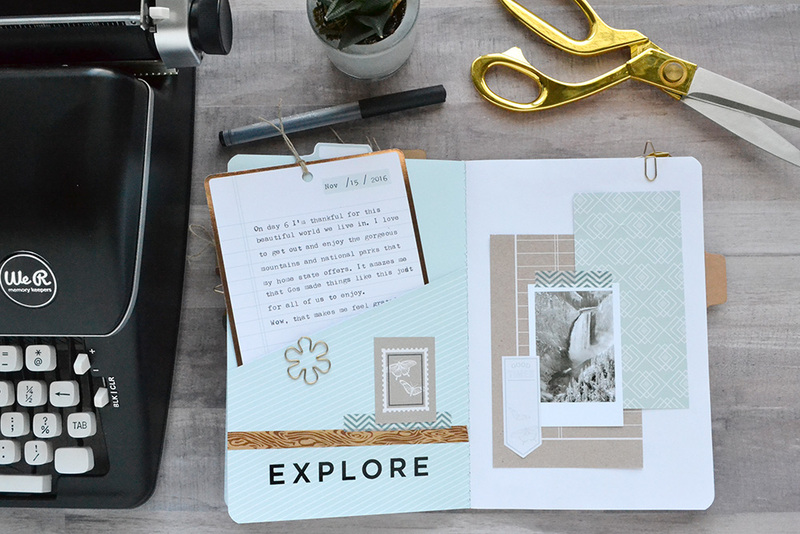 For more Cinch project ideas, tips and information, check out this Scrapbook.com article HERE. 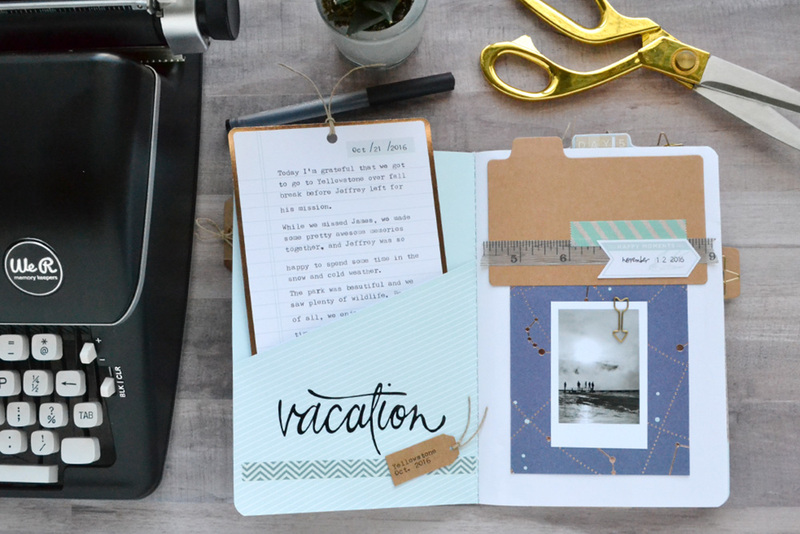 Hey there We R Memory Keepers friends and fans, Becki here, to share a fun travel art journal that I created with the Stitch Happy sewing machine (with grey twine), the Supreme Ruler, and the Tab Punch Board. This Summer/Fall is full of crafty adventures for me. I’m SO excited and determined to document all of my adventures along the way. I decided to create a small travelers note book/art journal. I started by using the Supreme Ruler to cut down the gigantic watercolor paper that I picked up at my local craft store. I wanted a heavy good quality watercolor paper because I planned on using ink, paint, and watercolors within the journal. I cut the paper down to 8 1/2 x 8 1/2. I cut one piece of patterned paper to 8 1/2 x 8 1/2 for the cover of the journal. Then I used the Supreme Ruler again to draw a straight line down the center of the journal so I could stitch down the center of the paper. The Stitch Happy sewing machine stitched through the heavy watercolor paper like a champ! After stitching through the stack of paper I folded the journal in half to create a book. Inside the journal, I went a little crazy with paints, watercolor, and Heidi Swapp color shine. For each section of the journal, I created a tab using the Tab Punch Board. Each tab is embellished with a cute little puffy heart sticker. On the first page of the journal, I created a frame with the Frame Punch Board. Inside that frame, I typed all of the cities I will visit on my crafty adventures. On the first full spread in the journal I added a few photos from my adventure on top of the Heidi Swapp color shine background. I can’t wait until my little crafty adventure journal is clear full! 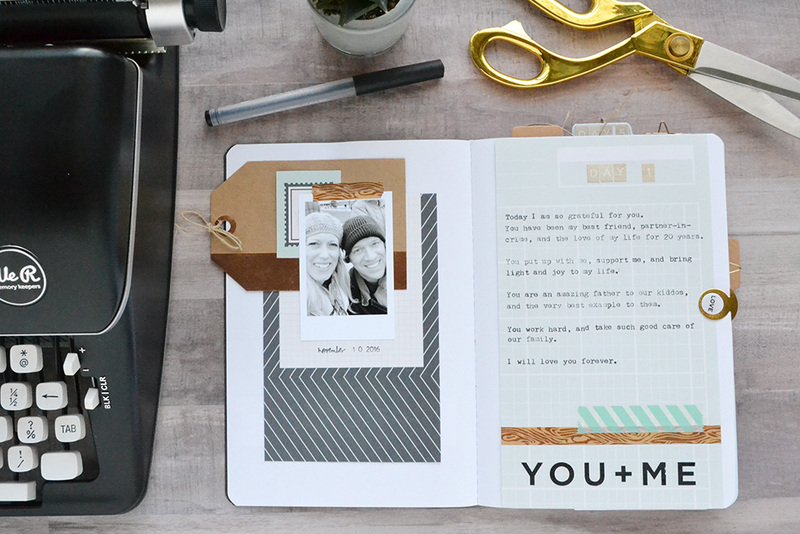 It was so fun and so easy to create using many of my favorite We R Memory Keepers tools. Thank you for stopping by the We R Memory Keepers blog. I’ll see you again soon! Hello everyone! 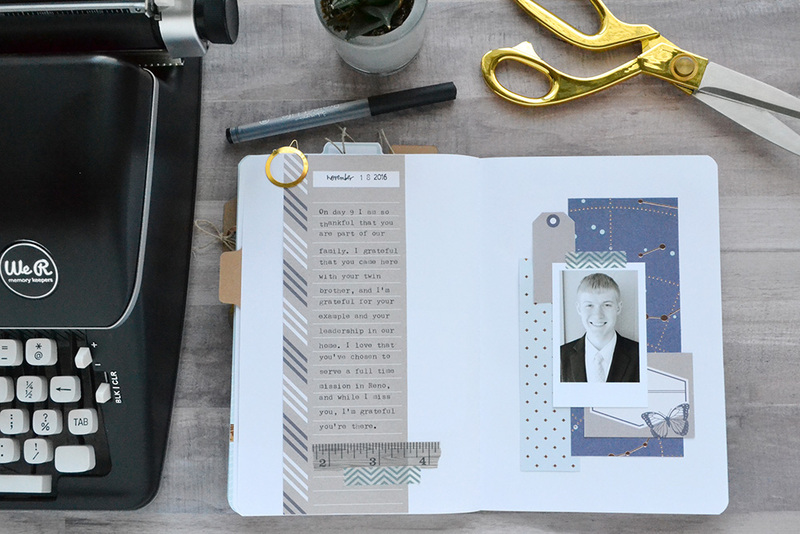 It’s Eva Pizarro with you today sharing a quick Planner project using the new Hole Reinforcer Punch. I don’t know about you but I always procrastinate some things from my daily to do list. To be able to notice important things in my planner more quickly, I decided to create small tags and attach them with small pieces of washi tape. To make the tags I used small pieces of patterned paper from the Creekside collection by our friends 1Canoe2 and made a small hole using my Crop a Dile. To embellish the tag and make it look perfect I added a circle using my Hole Reinforcement Punch. 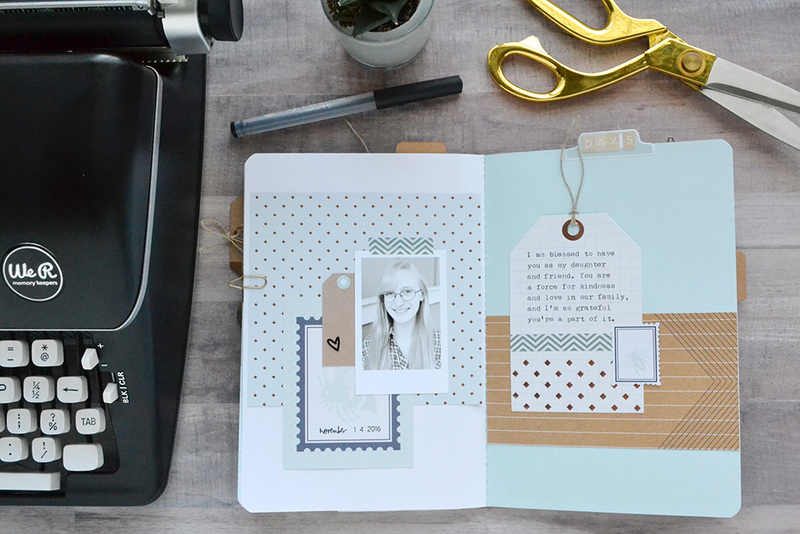 This punch is perfect for the Planner Lover! You can add extra pops of color in seconds and your inserts will never tear out again! To add a little more journaling space I used one of the 4 x 6 inch cards from the 12 x 12 Paper Pad and added some punch outs using my Hole Reinforcer punch to embellish it a little bit, specially the white side of the card. Tip: Put washi tape on top of patterned paper, punch, remove from the paper and you have a sticky hole reinforcer ready to go! My other go to embellishment is washi tape! The new Washi Chomper Washi Tape from We R Memory Keepers come in 4 beautiful colors and have small sayings perfect for planners. Combine them with the new Washi Chomper and you are going to get your planner ready in minutes! I am sure this new little tool is going to become your next planner best friend, Do you have any other ideas on how to use it?